This whitepaper examines the "Bring Your Own Device" (BYOD) movement, from carrying around a floppy disk to today's "cloud" services. This paper explains that employees may not be aware that their file transfer methods can cause a risk to security. Ways to ensure that employees can securely send files without risking corporate data security and what that dangers are with BYOD transfers are also discussed. Recent security breaches are referenced in the paper, and why such attacks are expected to continue into the future. 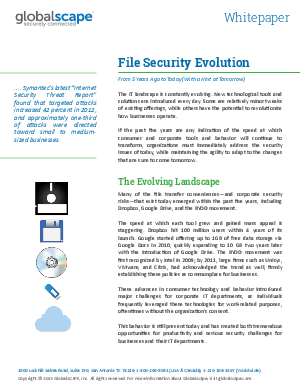 The paper concludes with a description of how companies can ensure data security and how Globalscape's secure file transfer products meet and exceed that need.